Film industry in Indonesia endlessly present the very interesting film and one of the films that are now booming is a sequel of Ada Apa Dengan Cinta ?. An advanced film of Ada Apa Dengan Cinta? in which aired in 2002 is eagerly awaited by fans. The film is directed by Riri Riza is a romance movie starred by Nicholas Saputra who acts as Rangga, Dian Sastro who acts as Cinta and there are also friends of Cinta, who stares by Titi Kamal, Sisi Priscillia, Dennis Adiswara. This film tells the story of gang members of Cinta that has now been transformed into a metropolitan women who consider drinking sweet iced tea at a roadside of Yogyakarta is very special and also Rangga are still struggling with the problems of life lived with a sense of reluctance. With the distance of time so long from the first film, the sequel of Ada Apa Dengan Cinta? 2 is expected to be the answer of all the puzzles in the first Ada Apa Dengan Cinta?. Unfortunately the answer is presented entirely unsatisfactory and it just feels like delicious cotton candy chew, but it did not leave an impression. The unique love story of Rangga and Cinta was indeed sensational. They mutually harbored feelings and when they know the way they do was wrong, separation at the airport is the best way to vent it all. When they were reunited fourteen years later, they are hard to find an appropriate logic to justify the repetition of pieces romance conducted on the previous films. Ada Apa Dengan Cinta? and its sequel should not be regarded too seriously. This movie soared is aimed to please the audience. But when the screenplay was written hastily and ignored the logic, the good idea like anything will not stain in the memory. The famous film director Riri Riza and the screenwriter Mira Lesmana was unsuccessfully laid the foundation of reality to the story of Ada Apa Dengan Cinta? 2. From the beginning of the film, already make the audience confused. The gang of Cinta gathered to wait for Karmen, who was recently completed of the problem, and cinta and gang felt to need to console her go on vacation. After everyone was assembled, Cinta announced her engagement with Trian. In these scenes were not told previously how karmen problem before and how Cinta can have relationships with Trian. Thus making the audience had to guess what happened earlier. Meanwhile in New York Rangga look restless, as usual, when he comes to the coffee shop that he had with his friends. He felt restless and he did not know why he felt that way. Moreover, during this audience knows that Rangga always looks like a lot of problems to him. Suddenly his half-sister came all the way from Yogyakarta to convey that Rangga should meet with her mother, the mother he had never met after 25 years. Whereas in the first film rangga mother never referred her existence and who knows what happened to his mother. But in Ada Apa Dengan Cinta? 2 his mother suddenly presented that make the audience more and more confused with the plot of the story. With the set-up as weak as that, it is easy to imagine how it would be the film did. The story is not better to be followed and some parts were something forced. Writing the story like the first time create a scenario and still do not understand how to write a story. Each character like not built properly and the background of the story character is also not strong even for people who are supposed to be in thirties are nothing changes from each other’s behavior while still in school. The only figure that had not been changed in this film is Milly who still entertained by her acting, that are funny and ridiculous. Rangga that now is not the person who sensitive like in the first film, he had more initiative now. Whenever Cinta was angry, he felt need to improve the situation, he did not want to waste time maybe just a bit of it. In a series of this scene the audience are invited to recall how strong chemically created by the two actors. If this movie is only focused on the two of them, this film definitely better. But for another reason, it seems indeed story of Cinta and Rangga enough to end up at the school period. I always think that every single person in the world has a different of mind. We cannot always compare our perception to each other because of that (has the different of mind), actually, honestly, or perhaps (?). Well, it might be “perhaps” because it is none from the scrutiny or something scientific research-detailed examination; it is only based on my observational research. Yes, it is (probably no because I do not search an article about different mind in a person/human, yet). Why can this thing appear in my mind, while truthfully, this kind of insight—perception appeared to other selves, too? This thought usually comes when I have my me time (5 minutes or less are included, though) after doing something riot because of myself and other things such as (another) human, human, and human. It close-knitted with perception which, according to Oxford Dictionary, means “the way you notice things, especially with the senses” agreed by myself along to “the senses” that has a lots of meaning, too, then makes the statement of “every single person in the world has different mind” comes up. Then have interactions with that another human are actually a funny things-time-moment to spend, but, those can be disappeared when you find that your way of thinking with them are different. That is “the senses”. The meaning of the different mind itself explained, still, not so scientific just because it is an experiment and experimental to life for. One thing that I like about this different mind is I can explore the ability. In a hectic way, when I got the different mind to another human-friend, I would rather keep it inside my heart that I did not like it and want to rebel to them. That is why I cry a lot when I did not know what to say because of had a conflict to a person. Different mind can impede the introvert people who can commonly stay, is that true? No, that has no connection. Introvert is neither a problem nor the different mind, although different mind is not a problem. Professor of developmental psychopathology at the University of Cambridge, Simon Baron-Cohen said: the infant’s understanding of attention in others, a social skill found by 7 to 9 months of age, as a “critical precursor” to the development of theory of mind. Understanding attention involves understanding that seeing can be directed selectively as attention, that the looker assesses the seen object as “of interest”, and that seeing can induce beliefs. Attention can be directed and shared by the act of pointing, a joint attention behavior that requires taking into account another person’s mental state, particularly whether the person notices an object or finds it of interest. Baron-Cohen speculates that the inclination to spontaneously reference an object in the world as of interest (“protodeclarative pointing”) and to likewise appreciate the directed attention and interests of another may be the underlying motive behind all human communication. What a scientific research! I try to understand it, but honestly, I don’t get it much to what Baron-Cohen said. All I can conclude is to know how to interaction to other people who has different way of mind or thinking, we have to have understanding attention through the communication. We look at situations, events, and interpret what other people say and do, according to our own set of past experiences, culture, faith, values, all of which help us from our beliefs about us, about others, and about the world in general. The meaning we give events, the way we make sense of our world, is based upon our set of core beliefs. We look at situations, events, and interpret what other people say and do, according to our own set of past experiences, culture, faith, values, all of which help us from our beliefs about us, about others, and about the world in general. The meaning we give events, the way we make sense of our world, is based upon our set of core beliefs. Despite to compare ourselves to another person that actually has different of mind and think, give attention to that another person is the best way to do. Do not ever try to be a winner in one of conversation with that another person, you better to be a quite person. Lastly, turn the advantage to understand each other which has different mind in several ways when talk to other is we learn to be a patient person. Learn and exercise. Said no journalist on the headline of any newspaper, ever. Well, some students tend to be so sarcastic and cynic when we talk about college music festival. Well, it is reasonable because there is a tendency that some Unpad student held a music event that doesn’t have any relation with their major and also not relevant to their status as college students. And on the other hand, we should realize that the student has a freedom to make their own movement–not always a movement related to their specific major only, it could be music or the other kind of art. And I also realize that the one who could possibly make music as a media is not the student of the music major only. Nowadays, student’s music festival becomes so much popular, especially among Unpad student. With so many different concepts and contents, each student organization and community tries to hold the most beneficial and popular music concert or festival around the campus. Some students think that organizing music event should not become our big concern because it does not have relation with our responsibility as a college student. They don’t see a a neccesity toward students who organizing music festival. But actually, there are so many important things for us as a student to hold a music festival, but of course, a festival that is relevant for us as a college student. However, regarding our status as a student, does it still make a right thing for us to give a massive concern to organize a music event? And how can be this music festival having the same values with the Tridharma Perguruan Tinggi* as our indicator as a college student? Since a music become a big industry which has so many people that included in it, we should use this most popular art as a media to promote and campaign social issues. According to the third Tridharama Perguruan Tinggi, i.e Pengabdian Kepada Masyarakat, if we use the music festival as a media to promote a good movement, we can also make a big impact on society. Just like the Unpad FISIP Folk Fest did, the committee made the music festival to promote traditional culture. They showed that traditional cultures such as the traditional dance, music instrument, and children’s games were also quite interesting and valuable if it was presented as professional as they can. They’ve been successfully sending their message to many students who attended the festival that our traditional culture could possibly compete with the other popular culture. Besides using the music as a media to promote a movement, music can also become a fundraising or even, some festival music share their profit for the charity. One of them is LIGHT 2016, a music festival held by Industrial Engineering Unpar student. This Music festival gave their profit to Panti Sosial Bina Netra Wiyata Guna. Moreover, it is not only about the money, even before the main guest star, Raisa, performed, they also gave a chance for Wiyata Guna’s Band to performed first. It showed so much respect for them and also helping them had more confident in their real life. This kind of music festival is not only supporting the unlucky one but also giving so much real life-lesson for us as a college student about sharing. Moreover, based on my survey concerning the student’s music festival, most of the student agrees that student music festival is important. From 122 students who taking the survey, 60,7% voters agree that student music festival is important, 22% agree that it is not important, and 14,6% voters agree that it is very important. The other statistic in my survey also showed that most of the student agree that Student music festival should not be just a ‘music festival’. It should have some social issues or the charity event so the music festival could be something relevant to our status as the college student. The last data showed that an ideal music festival for the student is a music festival that is useful for the society. 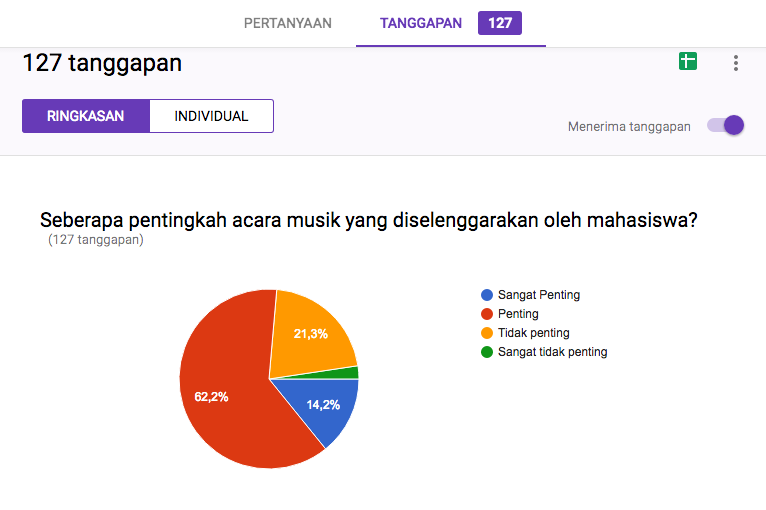 This data showed that most of the student having a relevant concept about what music festival is. So, for the conclusion, the student music festival is a very important thing to concern by the college student. Even though, some students think that organizing a music festival is unimportant and irrelevant for us as the college students. That kind of opinion is caused by their view that only sees the music festival as the music concert only. More than that, there are so many positive things in it if only the music festival itself could be the media to promote or campaign a social movement or become the fundraising for the needy. If we do those things well, the student music festival would be something that relevant to our status as the college student and to the Tridharma Perguruan Tinggi. If Einstein were still alive, perhaps Einstein would agree with the idea of making music as a media to promote his special relativity theory to make more people understand what he means. And if Giordano Bruno** were still alive too, I’d rather believe that he would support the Heliocentric theory by presented a rock music concert with a tagline “Rock Orbiting the Sun, and We Earth*** the Rock”. There would be a big chance that he would not burn to death–like what happened to him before, because there would be so many rock fans and musician who would stand by his side. * Tridharma Perguruan Tinggi: Pendidikan (Education); Penelitian (Research); and Pengabdian kepada Masyarakat (Social Dedication). ** Giordano Bruno supported the Copernican view – the view that the earth orbits the sun, and that the earth is not the center of the universe. Eventually, the Pope decided that Bruno was a heretic, with the result that he was burned at the stake in Rome. *** ‘Earth’ means ‘Are’ too in the tagline. I was thinking about my planned long-weekend that night; I would go home, meet my boyfriend, and hang out with my friends, as usual. However I needed vacation to refresh my brain, or I might dead tired due to these routines. Suddenly, a pop up of a message from David, which showed up on my phone screen, saved my life. “Do you want to come with me, Jaka, and Wahyu to Santolo beach tomorrow?” he asked me. I was so excited to hear that. I searched the information about the Santolo beach, how to get there, I read some people’s experience on their personal blogs, and I even was searching for the motel on the internet, until I finally found out that Santolo beach is at Pamengpeuk, Garut, and not Lombok. Gosh.. I got fooled by him. “Vid, Santolo beach is at Garut, isn’t it?” I texted my boyfriend. “Okay, then. Me and Wahyu will pick you up at Cileunyi. ” I replied. We were going to Garut by bus at 7 am, it only costed ten thousand rupiahs from Rancaekek or also well known as Dangder.It only took an hour to Garut’s bus station. As we arrived there, we had a breakfast and that was the first time I tasted Sundanese’s uduk rice which was so different from Betawi’s, because Sundanese’s not as tasteful as Betawi’s. After we filled our stomachs, we were searching an Elf- a mini bus, to Pamengpeuk. The residents said it might be taken five hours to get to Pamengpeuk, and that was right. I sat right next to the driver with David. When we left the bus station we would meet the bustle of Garut city, then after an hour the scenery changed to country view. There were typical country houses and paddy fields on the left and the right of the road. Another hours had gone by, straight road turned into sinuose road. Country view that we had seen before had changed into highland view. I felt like riding a roller coaster since the car was running so fast on the winding road. The air were so cool until it made my eyes so heavy. I looked into the backseat that my friend Jaka had been fall asleep to stranger’s shoulder, and that’s made me and david giggled. After the long road I smelt the scent of the beach. The air became warm. I could hear the sound of waves too. We arrived at the Santolo Fish Auction, the fishy smell bursted there. We had to cross the river by boat. It only took few meters to reach the island where the Santolo beach are, but we still had to use boat due to the height of water that we could’t handle by walking. When we got there, we were welcomed by a gate written ‘ Selamat Datang di Pantai Santolo’ and the jungle atmosphere because there were a lot of trees there. We were strolling around as we searched for some motels to stay that night till we reached the end side of santolo. Two of my friends decided to search a place to stay, after they asked me and david to stayed for kept their stuffs save. David and I sat at simple gazebo under a tree, then we saw children from santolo swam in the sea to scramble for money which thrown by the visitors as an entertainment there. I was throwing a coin to the sea, and the children started to scramble for the coin I threw. My friend came back and told us if they found the place to stay at Sayang Heulang beach. We had to walked along the seashore and passed two beaches; Santolo beach and Ranca Buaya beach, to get to the inn at Sayang Heulang beach. The water began to tide, it made us hard to walk. David fell into the water so all of his clothes were wet. We arrived at the inn. It was a small room with two beds and a bathroom for four of us. We changed our clothes to play at the beach and waited for the sunset. The sand was beige, not smooth, I still could feel the texture of shell. The characteristic of southern beach was the waves broke in the middle of the sea, so you wouldn’t be hit by the waves at the seashore. We went back to the inn when the sun had set and sky got darker, the waves were getting higher and closer too, due to the water had tide. We were starving after played at the beach, and we decided to eat the holy boiled instant noodle with egg because the grilled fish was so expensive there. After we cleaned up ourselves, we made bonfire at the edge of the beach in the night, accompanied by some musics and beers. We went back to the inn and sleep, because we had to wake up in the morning to caught the Elf to Garut’s bus station. We woke up at 10 am and packed our stuffs to go back home. We asked the hostel’s owner where we could find Elf to Garut’s bus station, and the owner said that if Elf is rare in here, we should walked about one kilo to the main road. Then we decided to ride stranger’s car. We waited at the edge of the road with our hands craned and thumbs up in the rainy day. Finally a truck loaded with cardboards gave us a ride, we asked to stop by when there was an Elf. Finally we found Elf and arrived at the Garut’s bus station at night, then went back to Jatinangor by mini bus. That was the most unforgettable trip ever, because that was the first time i rode a truck, the first time i tasted Sundanese’s uduk rice, the first time i went to Pamengpeuk. As Lao Tzu said, “A good traveler has no fixed plans and is not intent on arriving.”. No plans no worries, just go ahead.